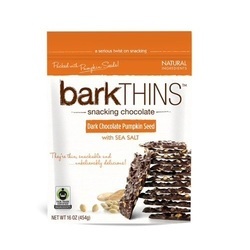 barkTHINS¬ snacking chocolates are a handcrafted twist on traditional chunky bark. Super thin slivers of rich, fair trade dark chocolate packed with salted pumpkin seeds. barkTHINS¬ are perfectly portioned for the serious chocolate lover.